Dinner tonight doesn't have to be hard to be fabulous. 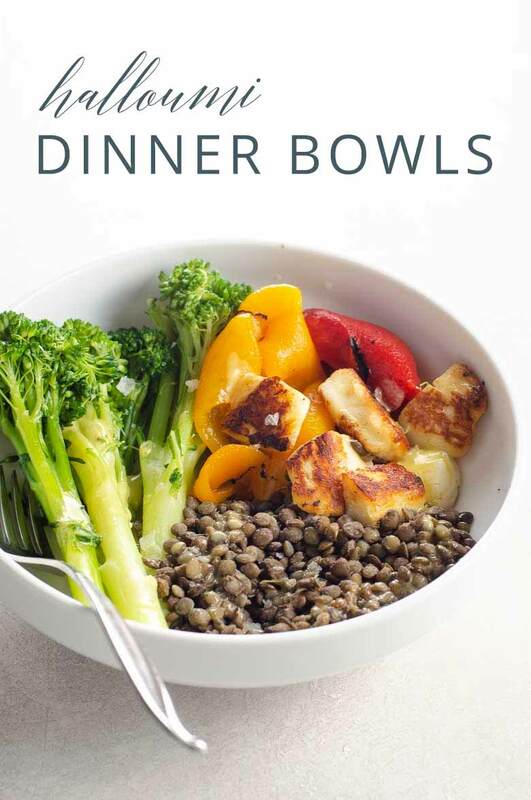 Case in point, these vegetarian, gluten-free dinner bowls with halloumi cheese, broccolini, savory Puy lentils, and roasted peppers all drizzled with magic blender dressing. They take 30 minutes max to put together, most of which is chill time while the lentils simmer away. If you're super-smart (like we sometimes are), you'll keep a pot of perfectly cooked lentils and a jar of magic blender dressing ready to go in the fridge. Halloumi cheese is life, my friend. We've loved it for years, but while living in London, it was suddenly available everywhere at reasonable prices, and now we're obsessed. Halloumi cheese originates in Cyprus. It’s made from a combination of sheep’s milk and goat’s or sometimes cow’s milk. When grilled or sautéed, it gets crisp on the outside and tender and dreamy on the inside. The taste is briny and herb-flecked and satisfying. Broccolini makes a great side dish on its own, roasted or simmered, maybe with gremolata. Here, we keep it simple, simmering broccolini in well-salted water until crisp-tender. It really doesn't need any adornment. Bonus: it's pretty kid-friendly, too. This quick and easy dinner bowl sports a rainbow of vegetarian, gluten-free flavors. 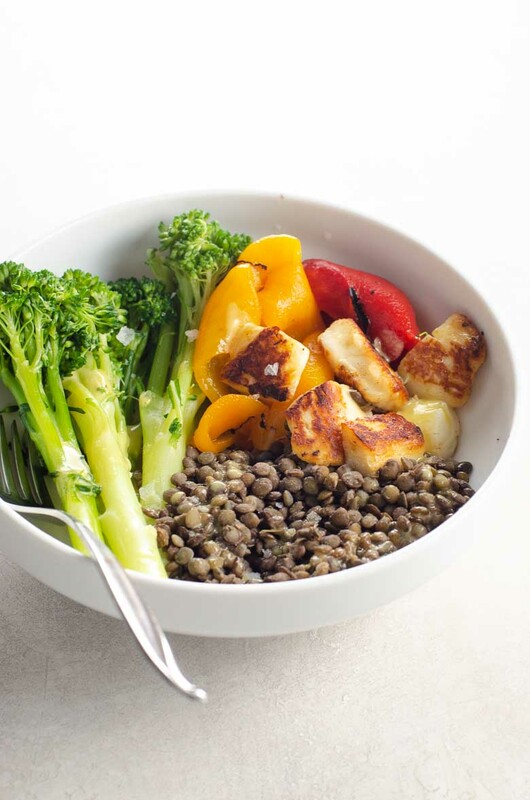 Broccolini, Puy lentils, savory halloumi cheese, and some roasted peppers straight from the jar get drizzled with our favorite blender dressing for a vibrant, healthy meal. If you're smart, you'll leave a pot of cooked lentils and a jar of magic blender dressing in the fridge all week, making this dinner a mere 10-minute endeavor. 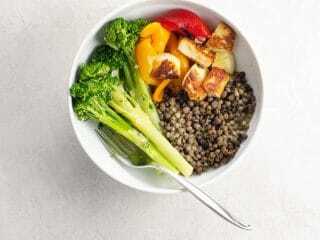 Prepare lentils according to our easy recipe for a perfect pot of lentils. Trim ends from broccolini. 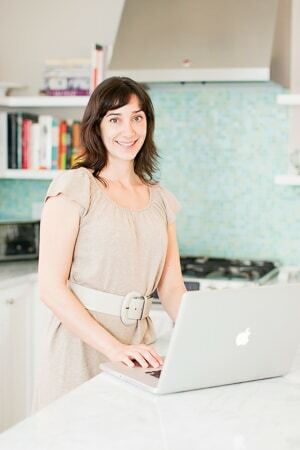 Bring 1 inch of water and 1 teaspoon fine sea salt to a boil in a 12-inch lidded pan. Add broccolini and cook until it reaches your desired tenderness. We like it crisp-tender, about 5 minutes' cooking time. Drain. Dice halloumi into 1/2-inch pieces. Heat oil in another 12-inch pan over medium heat until shimmering. (Or dry and reuse the same pan if the broccolini is done). Add halloumi and cook, turning a few times, until golden brown on several sides and warmed through. Divide ingredients among four bowls, or let diners serve themselves, and drizzle everything with magic blender dressing.